I have now finished reading the book and wanted to mention a few (maybe) errata-worthy pages. The first code snippet seems to have a stray "final". Normally this should not be a problem, but the "equivalent ternary operator code snippet" below has no final, which makes it not really equivalent, right? Last sentence of the paragraph after the big code snippet: "We are not allowed to refer to members of the Bird class since we are not in the same package and Bird is not a subclass of Bird." Did you mean "Bird is not a subclass of Goose"? First sentence of last paragraph: "Any time you see a method that appears to be overridden on the example [...]". It should be "on the exam", right? I also have some Errata for the Errata. There are wrong page numbers for two Errata items. One entry for chapter 4 says "page 11", but should be 191 (it is sorted between items for page 188 and 191). And the very last entry (for question #9 of Chapter 6 mock explanation) says "page 328" instead of 350. Both code snippets are about the assignment of a value to variable x depending on a condition. So from this point of view both code snippets are equivalent. But of course in the first code snippet you can't reassign a value to variable x as it's marked final while you can in the second code snippet. Jan Stückrath wrote: One entry for chapter 4 says "page 11", but should be 191 (it is sorted between items for page 188 and 191). Jan Stückrath wrote: And the very last entry (for question #9 of Chapter 6 mock explanation) says "page 328" instead of 350. Confirmed and logged all. Can you confirm I didn't manage to mess up the copy/pasting of the accent mark in your name? Lines 20 and 27 of the Bild class will not compile, triggered by the getText() method being overwritten in Goose. However, the casts in lines 21 and 28, which will always work, compile. Note that this problem does not occur if the subclass does not override the method, as can be seen in Line 20 of Goose (WildGoose does not override getText()). But this means that if we access a proteced method of another object of a derived class in the superclass using a non-superclass reference type, a change in the subclass can cause the superclass to not compile! Although this behaviour makes sense if we think about how protected is meant to be used, I find it counterintuitive on first glance. Jeanne Boyarsky wrote: Can you confirm I didn't manage to mess up the copy/pasting of the accent mark in your name? Yes, everything is correct. Thank you. Jan Stückrath wrote: Lines 20 and 27 of the Bird class will not compile, triggered by the getText() method being overwritten in Goose. However, the casts in lines 21 and 28, which will always work, compile. Note that this problem does not occur if the subclass does not override the method, as can be seen in Line 20 of Goose (WildGoose does not override getText()). But this means that if we access a proteced method of another object of a derived class in the superclass using a non-superclass reference type, a change in the subclass can cause the superclass to not compile! That's an awesome observation. Have a cow! 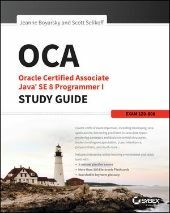 Java OCA 8 Programmer I Study Guide, Sybex wrote: A member is used through a variable. This is the case on lines 10, 11, 15, and 16. In this case, the rules for the reference type of the variable are what matter. If it is a subclass, protected access is allowed. This works for references to the same class or a subclass. Sorry about digging out the old thread.But I noticed a few things.Roel, In your 2nd post of the thread.. In Goose Class method2(), shouldnt this be ok-subclass . There is no "text" in the Goose class. And "other" is able to access "text" because it inherits it from Bird. In WildGoose method3(), shouldnt this be ok-subclass. Goose inherits "text" from Bird. And since WildGoose extends Goose it inherits "text" as well. there is no "text" in WildGoose. The line 20 is in the Bird Class and the reference is Goose .Goose is a different class and not the same as the protected method. and when you cast it to the same class as the protected method(Bird), it works fine. (my understanding) Line 27 doesnt compile because, though "other" is a subclass reference(of WildGoose). But it is in a different class(Bird). And so access is not permitted. Let C be the class in which a protected member is declared. Access is permitted only within the body of a subclass S of C.
Please do correct me, If I have misunderstood something. Ramya Subraamanian wrote: In Goose Class method2(), shouldnt this be ok-subclass . There is no "text" in the Goose class. And "other" is able to access "text" because it inherits it from Bird. No! "same class" refers to the type of the reference variable, not to which instance variable text is used. So for example in method2() of class Goose, the type of the reference (local) variable is Goose => "ok - same class". (Instance variable text will indeed be inherited from superclass Bird). There is also a protected method getText() defined in the Goose class. On line 20 the reference variable is of type Goose, so it's the same as the class which defines the protected method. You are correct about casting the reference variable to Bird (as illustrated on line21 and line28). But the only reason why this compiles, is because class Bird defines a getText() method as well, which happens to be protected. But the access modifier is irrelevant in this case, because the reference variable is the same as the class defining both methods. So even if the getText() method in class Bird would have been private, both lines (line21 and line28) will compile too. same class" refers to the type of the reference variable, not to which instance variable text is used. So for example in method2() of class Goose, the type of the reference (local) variable is Goose => "ok - same class"
okay, thank you. understood it now. But that overridden getText() will not be visible at all from another class(Bird), because it is protected and in another package.I thought "same class" meant the Bird class.But Yes, it would compile even if getText() were private. And also thought that "references to the same class ..." in the book meant the references to classes like the Swan class or its subclasses.